The Yars land-based mobile missile system is transported to its field combat duty site at the Teykovo Guards Missile Division. Four or five regiments of the Russian Strategic Rocket Forces (RVSN) are re-equipped with Yars strategic missile systems annually, RVSN Commander Col. Gen. Sergei Karakayev said. "Five more regiments will be re-equipped with these systems in 2016. The rearmament of the Irkutsk and Yoshkar-Ola divisions will be started and that of the Novosibirsk, Kozelsk, and Nizhny Tagil divisions continued. Twenty intercontinental ballistic missiles will be supplied to these divisions," Karakayev told journalists on Dec. 16. Five missile regiments will be put on combat duty at the Nizhny Tagil, Novosibirsk, and Kozelsk divisions in December 2015, Karakayev said. "Just as was planned, Yars ground mobile and stationary missile systems have been supplied to the forces in keeping with the state defense order," Karakayev said. "Such a quick rate of the RVSN's re-equipment has been achieved due to the use of the ready infrastructure of deployment sites of the divisions of mobile ground missile systems, which made it possible to significantly reduce the costs of introducing the new Yars mobile missile system to the RVSN," he said. 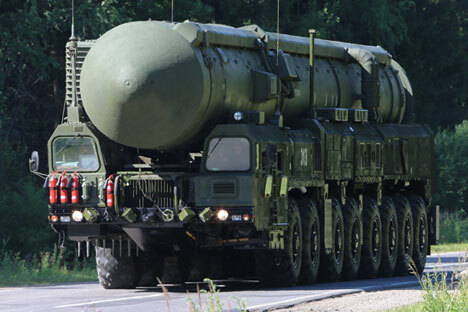 "This system boasts features making it extremely complicated for the opponent to counteract, such as a reduced boosting phase, which is significantly shorter than that of the ICBMs of previous generations, a new coating of the missile's body and other elements, a durable and lightweight design, and powerful engines and control instruments capable of operating with significant overloads," Karakayev said. The new missile system is to replace the ageing fourth-generation ICBMs, i.e. the single-warhead RS-12M Topol and the multiple-warhead RS-18 Stiletto as soon as their extended service lives expire, he said. "Along with the RS-12M2 Topol-M single-warhead missile system, the RS-24 Yars mobile ground missile system will make up the RVSN's core in the near future," Karakayev said.